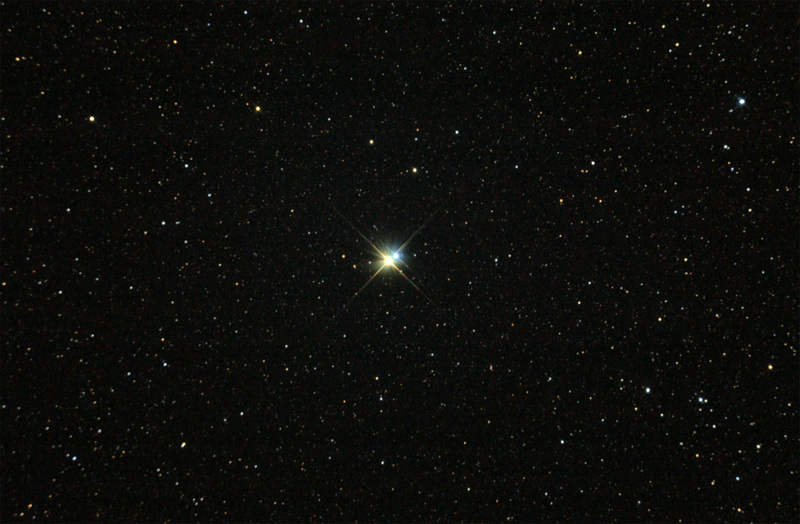 Albireo is a double star found at the head of the constellation Cygnus (the Swan). The stars of Cygnus form a large cross (the Northern Cross) directly overhead in the Summer sky in the Northern Hemisphere and Albireo is the star(s) at the base of the cross. When viewed with the naked eye, Albireo appears as one star, but when viewed through binoculars or a telescope, the beautiful contrasting topaz and sapphire colors of the double star become apparent. The two stars are a true (as opposed to a visual) double, meaning the stars are gravitationally bound. At a distance of 385 light years the projected separation is some 400 billion miles. Fifty of our Solar Systems would fill the gap if stacked end to end. The gold colored star, which is about 80 times larger than our sun, is actually a double star itself with a very close companion, making this grouping of stars a rare triple star system. Albireo is one of my favorite stars in the sky and I often stop for a glance whenever I'm observing in this part of the sky. 10X30 seconds, ISO 800, moonlight night.